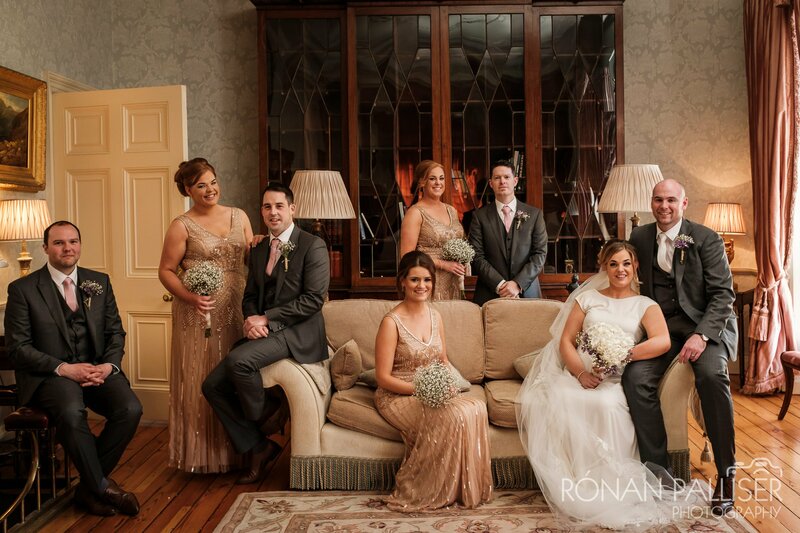 It might give a little insight into how much I enjoyed photographing at Fiona and Ian’s choice of venue – Tankardstown House – if I tell you that when I recalled, on my way home from their wedding late on Saturday night, that I am due back at the venue again in September, I almost did a little happy dance in the car! And yet the venue wasn’t even the best thing about Fiona and Ian’s wedding for me. The day was definitely enhanced by the weather which was simply perfect – the kind of day you’d wish for in July, and this is only March. It meant drinks were on the terrace, photos were in the gardens and sunglasses were the required accessory of the day. And yet the weather wasn’t the best thing about the day for me. The best part was, with an emphasis on more mingling, less posing, I was given carte blanche for the entire day to capture it as I saw fit. Yes we did minimal family and bridal party photos, but really did keep them brief, and for most of the day I was able to watch, anticipate and capture what was happening in the way I love. And there was a lot happening. I started my day at Fiona’s family home in Glasnevin which was a hive of activity, while a few doors down Ian was getting ready with his groomsmen in Fiona and Ian’s own house, and hopping between the two was their adorable 3 year old son Adam. With stuff happening everywhere you looked, and a gaggle of kids in the middle of it all, it was this photographer’s dream wedding morning! The ceremony was in the beautiful surroundings of Rathfeigh, Co. Meath and Fr. Kennedy had the guests almost rolling in the aisles with his sense of humour throughout the ceremony. After the quick family photo session once the church had emptied, we headed straight for Tankardstown and while Fiona and Ian joined guests who were being entertained by saxophonist natalia.ie and cartoonist Caricatures by Niall O’Loughlin​, I set about capturing all the goings on, as well as the smaller details of the day. Once the guests sat for dinner I was able to quickly capture a few images of the venue from the air thanks to the grand stretch in the evenings that there is these days, even more so now that the clocks have changed, and I rejoined the party after dinner in time for the speeches. Four speeches, each perfectly pitched, with Ian prompting happy tears from Fiona’s sisters whenever he said nice things about his new wife! My role in the day finished after the first dance, having captured a high-pressure sparklers photo of the entire wedding just after the speeches and a night time shot of the couple before dancing. Of all the photos I took, it was my last photo of the day that would prove to be one of my favourites, not because it’s a particularly amazing photo or anything, but because of the moment it captures – Fiona and Adam sharing some mother-son time with a board game, oblivious to the rest of the party around them after the first dance. A little moment for just the two of them, and a lovely thing to see, and to capture.